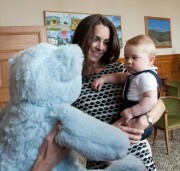 Kate wore the Tory Burch Paulina dress for the first time during the 2014 Royal Tour of New Zealand and Canada, during a play date with Prince George and ten children from the Royal New Zealand Plunket Society. This gorgeous black and white patterned dress is from Tory Burch’s Resort ’14 collection. It is a knee-length dress with a cinched waist and has elegant pleats and tactile fringing. Classic meets eclectic in a ladylike silhouette with a graphic, open knit and textural fringe. The Paulina Dress — a style from our fashion show — makes a striking addition to any wardrobe. It features an all-over lacy dot pattern in black and ivory, creating cool optical contrast. A fitted waist and a slightly flared, pleated skirt have a figure-flattering effect. The finishing touch: tassel-like trim along the sleeves and hem.